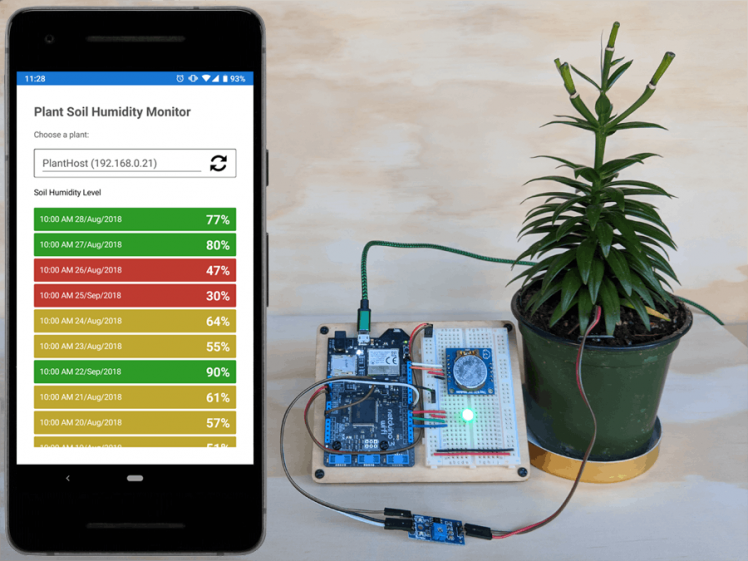 In this project you'll learn how to make your own soil humidity plant monitor that checks the soil moisture periodically and log the data to an SD card stored in the Netduino. 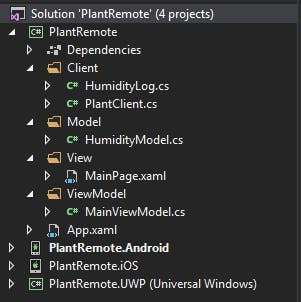 You'll query the data using a Xamarin app so you you'll always know when to water your plant. You will use a soil moisture sensor that is placed directly into the plant pot or soil bed. The sensor has two probes and measures the resistance between them. Since water is conductive, as moisture in the soil increases, the resistance decreases allowing the sensor to determine soil humidity. The Netduino will periodically poll the senor and log the value to the SD card along with the date and time (using a RTC module). To send the humidity logs over the network you'll use the light-weight Maple REST server. Maple makes it easy to build connected devices with Netduino by exposing control via a Web API. Maple is an open source, ultra-lightweight, JSON enabled, RESTful web server built specifically for Netduino devices with network capabilities. An RGB LED is used to give user feedback based on the state of the soil sensor, for example: when the Netduino joins a network, the soil sensor is active, or Maple receives client requests. You'll communicate with the sensor using Netduino.Foundation. Netduino.Foundation. 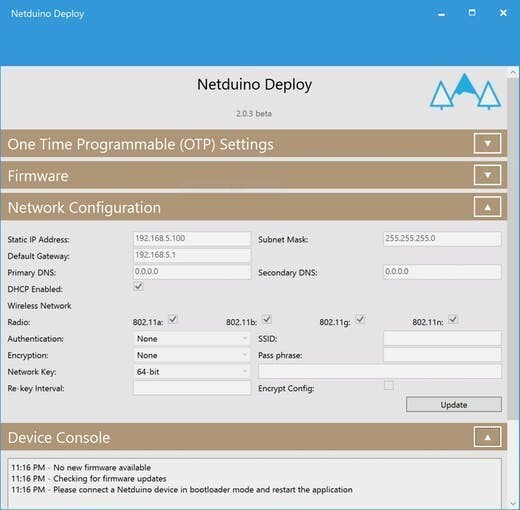 is a platform for quickly building connected things using the .NET MicroFramework on Netduino. Created by Wilderness Labs, it's open source and maintained by the Netduino community. If you're new to Netduino development, I suggest you go to the Getting started with Netduino project to set up your development environment. If you're using a Netduino 3 WiFi, select the proper encryption, authentication, SSID and pass-phrase settings and finally click on Update to save those settings to the Netduino. Once the network settings are saved to the device, remember to disconnect and reconnect your Netduino back to your computer to leave bootloader mode and its ready to run the project once its completed. Create a Netduino project in Visual Studio 2015 for Windows or in Visual Studio for Mac; name the project PlantHost. 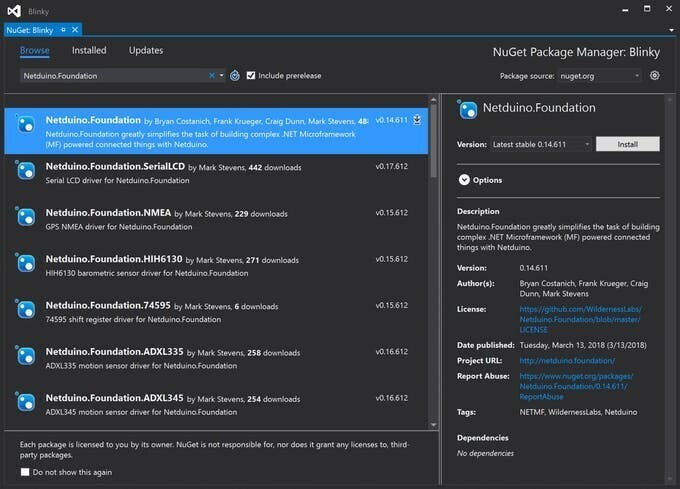 Right-click on your PlantHost project and click Manage NuGet Packages. In the Browse tab, search for Netduino.Foundation; it should be the first search result. Click the Install button. You'll use three (3) additional nuget packages. Search for Maple,Netduino.Foundation.DS3231 and Netduino.Foundation.Network and each one to your project. Alt-click on your PlantHost project in the Solution Explorer, and click Add => Add NuGet Package to open the NuGet Package window. Search for the Netduino.Foundation package and click Add Package to add it to your project. You'll use three (3) additional NuGet packages. 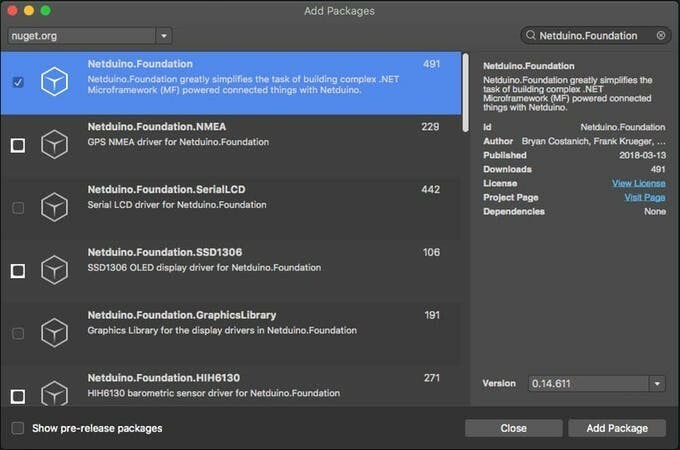 Search for Maple,Netduino.Foundation.DS3231 and Netduino.Foundation.Network and add them to your project. Notice that when the getPlantHumidity endpoint is invoked, it will trigger an event that will be handled in the App class, and send App.HumidityLogs as a json response message with the ArrayList HumidityLogs that is accessible in the App class. This is a simple model that the project will use to log the date and time along with the moisture level. 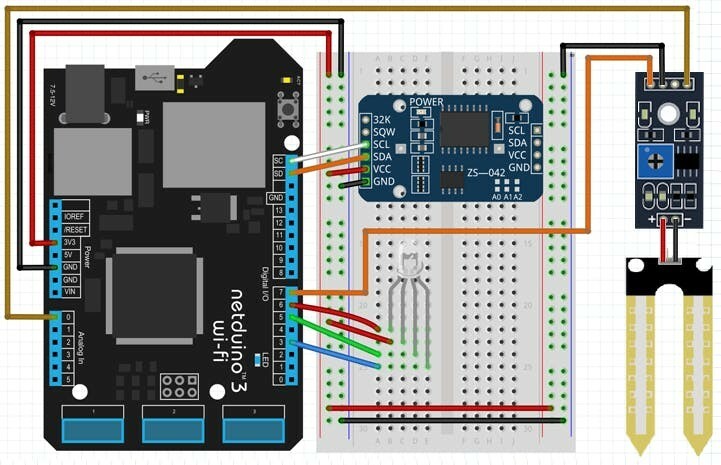 This controller is a simple driver for the soil moisture sensor. It uses an analog input, which is in charge of reading the value of moisture in the probe that is placed in the plant's dirt, returning a value from 0 - 1023, 0 being very moist and 1023 very dry. A digital port is also used to quickly activate the sensor, and the analog port to do a read. Note: When completed this project, you could calibrate your humidity sensor value by placing it on a very dry and very wet dirt sample to check the optimal edge values, and set them in the fromLow and FromHigh parameters of the Map method for better precision. After reading a value from the sensor, it makes sense to return a more understandable moisture value. We invoke the Map function which is a simple math formula to remap a number from one range to another. In this case, we'd like to get our raw >here. Save(ArrayList HumidityLogs) - Save the entire array list into a text file named logs.txt, serialized in json format. Load() - Reads the content of logs.txt, deserialize it and converts the list into an ArrayList of HumidityLogs, and returns it to the App class, where its invoke in its constructor. At this point of this project guide, what's left is to first run the peripherals connected to the Netduino, which in this project, is the DS3231 (which is the RTC chip), a HumiditySensorController and a RgbPwmLed, and this last one will light up a red hue. After setting up the peripherals, it now calls InitializeWebServer, and here you will use the RequestHandler. Then register the event handler for the exposed GetPlantHumidity method explained previously. Finally create a new Maple instance, and assign your RequestHandler object to its Handler property. In the Run method, the first thing you need to do when starting the project is to use Initializer.InitializeNetwork();. Netduino boards need to initialize their network every time they're powered on, so before starting the Maple server, you need to make sure that the Netduino has connected to the network successfully, and that it has received a valid IP address. It will do so when the RGB LED has turned green. When the Netduino has joined the network, you can now safely start the Maple server by doing server.Start() passing the name of the server and the IpAddress assigned to it. At this point, the app is using a Timer to schedule firing an event to activate the sensor and log the data in the MicroSD card. 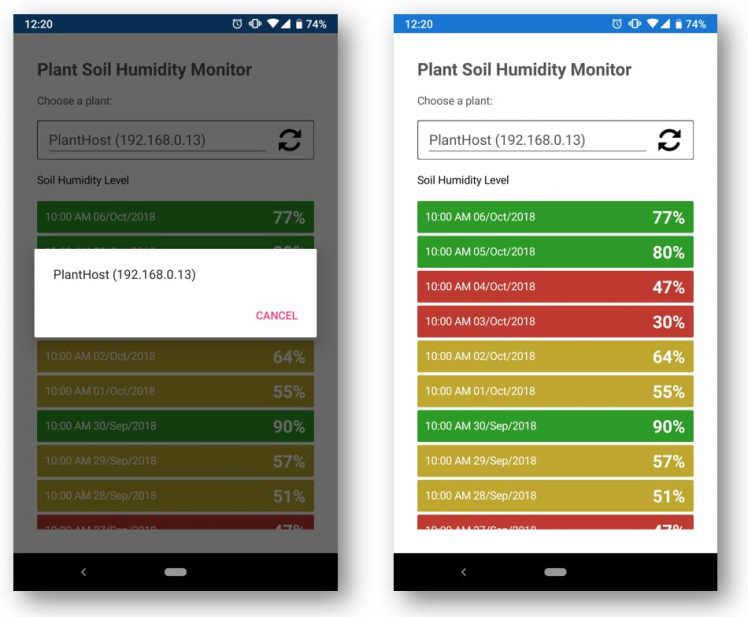 Add a new HumidityLog record to the ArrayList, by activating the soil sensor at that time. Blink the RGB LED blue for 1 second to indicate that the Netduino is using the sensor. This method will be fired whenever a client request has been received, and it will make the RGB LED blink for one second in an orange hue to indicate that the Maple has received a server request. That is everything that you need to do for the PlantHost project. When you run the project, you will see the RGB LED lighting up red, and it will turn green until it successfully joins your network. Right after joining the network, the next thing it will do is activate the sensor to check the soil humidity right away. Every time it does that, the RGB LED will blink blue for one second, and then it will go back to green. Finally, when PlantHost is receiving client requests, the RGB LED will blink orange for one second, and it will turn back to green. The take away for this project is the how we connect to maple using the MapleClient NuGet Package, which has a simple implementation of a HttpClient to send/receive server requests to/from the Maple server, and a UdpClient to receive UDP broadcast messages coming from one (or more) Maple servers running, and the app will list them on a Picker so you can select to which Netduino you wish to connect to and send requests. Lastly, the class where you send the API requests to maple is in the PlantClient class. Notice that it extends from MapleClient, and it has the /PlantHumidity request data from your Netduino. The GetHumidityAsync function will send a get PlantHumidity request to the Netduino, and will return the HumidityLogs and display the data in a ListView. Now run the PlantHost project on your Netduino, and wait till your RGB LED turns green, this indicates that the Netduino has successfully joined your network and has started the Maple Server. PlantHost and PlantRemote projects in action! It comes with a huge peripheral driver library with drivers for the most common sensors and peripherals. The peripheral drivers encapsulate the core logic and expose a simple, clean, modern API. This project is backed by a growing community that is constantly working on building cool connected things and are always excited to help new-comers and discuss new projects.